Through an online survey launched in March, a community open house held on March 30 in Oregon City and a virtual open house hosted online in April, hundreds of people shared their hopes and concerns, likes and dislikes and what types of activities and experiences they want to see incorporated into riverwalk design. 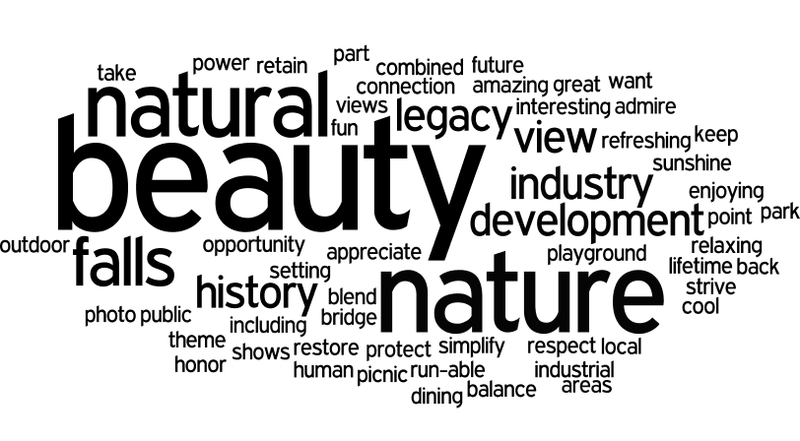 Browse the open house event summary online, which contains many of the images shown at the open house, as well as some cool word clouds (word-image associations) like the one shown above. Thank you to all who have shared their ideas and inspiration for riverwalk programming! The project team and design collective are eager to learn what people want to do, see, feel and experience at the riverwalk, and your feedback will influence their work as the riverwalk project continues to move through its design phase this summer and fall.